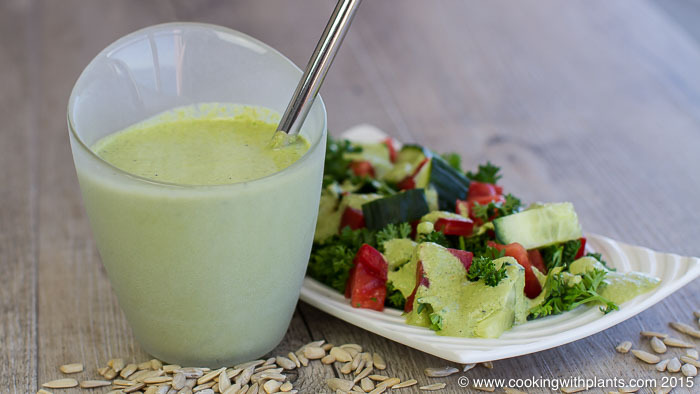 This super tasty vegan sunflower seed ranch dressing will get your taste buds dancing! The fresh flavors of this dressing are fantastic on a salad, pasta or potatoes. Serve on your favorite salad, potatoes, pasta etc. Hello! Should I omit the salt if I use salted sunflower seeds? Love you channel! Yes, and adjust at the end if you feel you need more. Another great recipe for me to try. How long do you think this will this keep in the fridge? Thank you for sharing and all the hard work you do putting these videos together to share with us all, I really enjoy them all. Keep up the good work. Seems amazing and so healthy! Delicious, fresh tasting and full of goodness. Ticks all the boxes. Maybe try 1/2 tsp and adjust to your own taste if needed. Anja…where did you get your small blender? its awesome and the perfect size. Thanks for all your wonderful recipes. Hugs my friend. I ground up my sunflower seeds. I wonder if you could make this recipe with that, but make a video on it? It should work. Did you try it? Hello. I think to try this recipe tomorrow, but i have some questions :). Can i skip the garlic at all and with what i can change the mustard, if it have something optional for it. Thanks in advance. Hi Anja. Are the sunflower seeds you use raw or roasted? Thanks!! hi anja as i have said before i love ur recipes. i have tried the butter(love love it), the potato bake, the dressing ( which i use on everything)awesome,and the german potato salad ,which i tweaked to make more vinegarie .these are all delish, but my favorite is still the sweet pot and kale bake. your recipe for that has been shared many many times by moi.thank you for all ur hard work.